This week the challenge is Make it Sparkle! This is my take on the Make it Sparkle challenge. I have used Technique Tuesday Cath Edvalson’s Garden Flowers die set on my card. I decided to make a sparkly shaker card with the Garden Flowers die as the focal point. I die cut the outline of the flower using black glitter cardstock and the solid piece in watercolour paper. 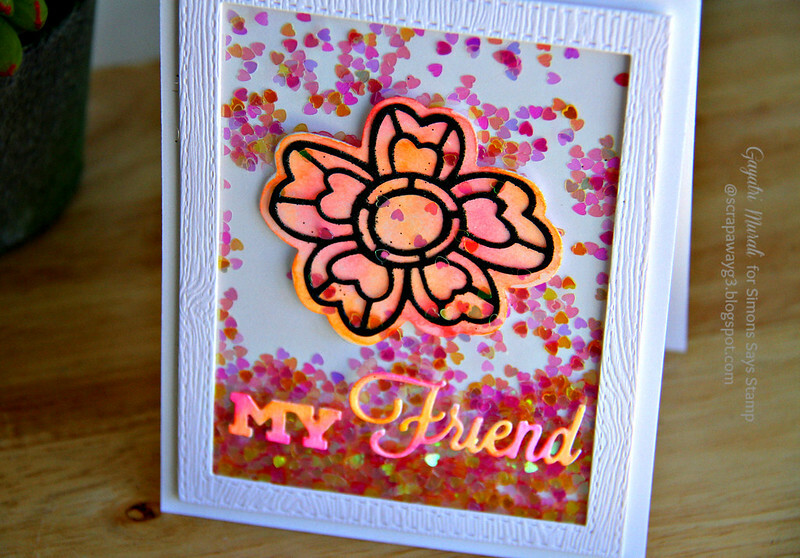 I watercoloured the solid die cut using orange and pink Zig Clean Colour brush pens. I layered the outline flower over the solid flower. I also die cut the sentiment from the Garden Flowers die set using watercolour paper and watercoloured using pink and orange Zig pens. Then I made a shaker box using Simon Says Stamp Stitched Rectangle die set as the box frame. I adhered the acetate sheet on the inside of the frame. I stuck the flower die on the centre of the card front. Then added pink and white iridescent hearts from Martha Stewart around the flowers before adhering the shaker box frame on the card front. I then adhered the sentiment die cut on the acetate sheet on the frame. Shake shake shake – love it! Love all those tiny hearts behind Cath's beautiful die, Gayatri! Someone will adore this card! A gorgeous shaker card Gayatri, a fabulous design with the pretty flower and multi-coloured sentiment and lovely sequins. I hope you and family is a wonderful Christmas! !